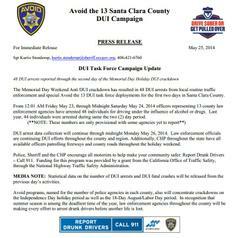 So far this Memorial Day Weekend 48 people have been arrested for DUI, this includes 22 that were arrested on Saturday. Last year during the same time period, 44 people had been arrested for DUI. Remember, to always plan ahead and find a sober driver if you are going to be drinking. Deputies will be out looking for drunk drivers the rest of the weekend.